Sheraton Bay Point Resort will host Business After Hours on Thursday, July 26 from 5:00 PM to 7:00 PM. Join fellow Beach Chamber members for networking, hors d’oeuvres, cocktails, and the opportunity to make beneficial business connections. This event is sponsored by DRT/Disaster Response Team, and is exclusive to Beach Chamber members. Beach Chamber members can register here to attend. 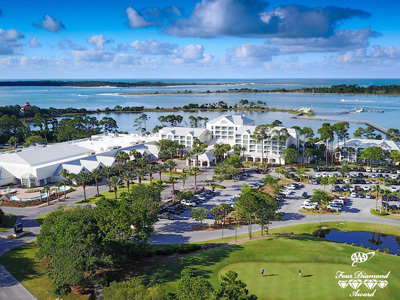 Situated along the historic St. Andrews Bay, the Sheraton Bay Point Resort offers views of the coastal marshes and tranquil bay waters. Their resort provides an escape from the crowds and noise without sacrificing a good time. Guests enjoy their spacious accommodations and array of fantastic amenities in Panama City Beach. Whether you’re visiting on a couple’s retreat, with a group or as a family, there are plenty of activities to keep everyone entertained. Delight in regional specialties and classic favorites at Tides, Sheraton Bay Point Resorts signature restaurant open for breakfast, lunch and dinner. Overlooking St. Andrews Bay, Tides is a relaxed but sophisticated environment to taste the flavors of Panama City Beach. They offer a daily breakfast buffet as well fresh seafood, savory steaks and expertly-prepared drinks. DRT/Disaster Response Team experience is unsurpassed when it comes to disaster response. Since 1964 Disaster Response Team has restored and rebuilt many homes and businesses in Bay County and the surrounding area. They offer services such as water damage restoration services, fire restoration, flood clean up, mold remediation, emergency board up services, wind and storm restoration, hazmat clean up, plus much more. They help put people’s lives back together.